Having referred to that supernal talk, which left the faithful with no doubt as to Elder McConkie’s witness, we often do not realize or remember that he bore a similarly powerful testimony in his first talk as an Apostle. On that occasion his voice also cracked with emotion and he also bore his witness by the power of the Holy Ghost. At that time he said that he had heard the voice of the Lord and that he had a perfect knowledge that God lived. “I know there is revelation in the Church because I have received revelation,” he said. “I know God speaks in this day because he has spoken to me.” It is no small thing to have the Lord Jesus Christ speak directly to you, and tell you what He would have you do, and what lies in your future. Elder McConkie did not indicate in this talk whether there was a veil between himself and Jesus or not, on these sacred occasions. In fact, Elder McConkie had given more than one powerful talk in the months prior to his apostolic ordination, in which the Holy Spirit had been poured out on the congregation, preparing the hearts and minds of the members of the Church to accept and sustain his call as a special witness. Earlier, Elder McConkie had spoken at his father-in-law’s funeral (President Joseph Fielding Smith), also in great power. He later told family members that he had seen President Joseph F. Smith in attendance there at the funeral of his son, thereby manifesting keen interest in his family. As a Seventy, Elder McConkie had heard these words, spoken into his mind by the Holy Spirit on the occasion of the sustaining of the First Presidency, and giving him exacting assurance of whom to line up behind as his leaders and guides: “These are they whom I have chosen as the First Presidency of my Church. Follow them.” This Elder McConkie did, with complete faith and fidelity. He, along with others, made some mistakes in his ministry and in his doctrinal presentations (though I believe those were few and far between), and he was no diplomat. (His doctrinal corrections to others could be stinging, though meant for the best of the recipient.) But he became a pillar of spiritual and doctrinal strength in the Church and one of the greatest of the Special Witnesses. It was said that Elder McConkie’s influence reached well beyond that of most apostles simply because of his scholarly-doctrinal output; many volumes of scriptural explanation that have engendered faith and spiritual knowledge in those who have been wise enough to read them. There are also those who foolishly desire to diminish his influence any way they can. They have enjoyed some success in some quarters, but among the faithful they have had little impact. As a certain General Authority once told me: “Doctrine lasts, and Elder McConkie knew it.” His books may not remain in hardcopy print on bookshelves, but they are availaibe in ebook form or olsewhere (such as Gospelink), and are yet teaching and inspiriting their readers. Anyone wanting to know what Elder McConkie knew of the future should read his The Millennial Messiah book, or study his prophecies in his conference talks (for example, see here and especially here). 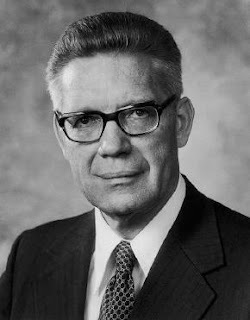 I remember hearing one of the current apostles mention that they sometimes heard President Packer read from Elder McConkie’s prophecies in their temple meetings, and review how they were being fulfilled. In the late 1980s and 1990s, even into the early 2000s, when I tried to get from the Church Historical Depaertment (as it was then called) a videotape or DVD copy of Elder McConkie’s final testimony, given at that great April 1985 General Conference, I was told that the First Presidency had restricted copies of his talk from being made. On asking why, I was told they (the employees working there) didn’t know why, just that the restriction was in place. I was left to come to my own conclusions, that perhaps they thought his special declaration too sacred. Such is only my speculation. However, with the passage of enough time, that restriction has been lifted and the talk is now available at the click of a mouse, to enjoy and be edified by. As a reminder, a much longer and more detailed chapter reviewing Bruce’s special witness will soon be found in my forthcoming book, I Know He lives: How 13 Special Witnesses Came to Know Jesus Christ.